This project began like many others with homeowners’ displeasure with the design and installation of patios that were originally constructed with their home. 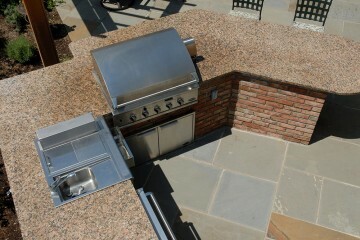 The patios were insufficient in size and poorly constructed so that after only three years they needed to be completely replaced. 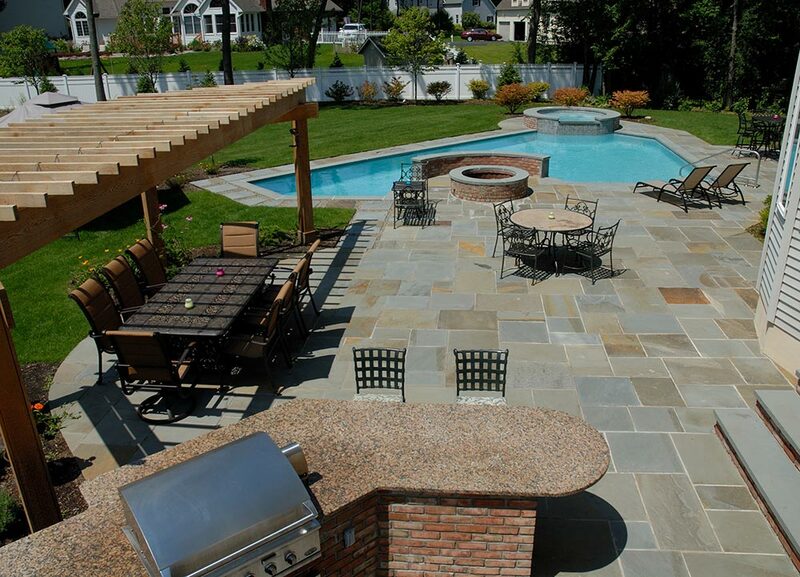 Upon reviewing the clients’ desires and needs we focused on the following: privacy from the neighbors, a larger backyard for play for their young children and dogs, an outdoor eating and entertainment space, as well as additional patio space. After completing the preliminary design it was determined that the owners desired some sort of water feature such as a spa, pool, lap pool, etc… After two additional design revisions were completed, the final design included: a custom designed pool with raised hot tub, 1200 square feet of dimensional bluestone patio, raised brick fire pit, two brick and bluestone stoops leading from two separate exits from the house, an outdoor kitchen which incorporated a barbeque, condiment sink, refrigerator and storage. 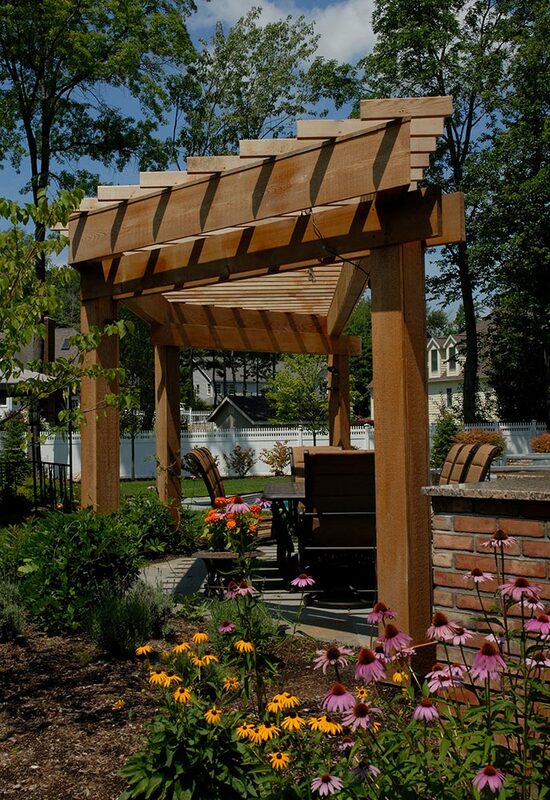 In addition, a cedar overhead structure was incorporated to create a sense of space and provide the vertical form and elevation to allow overhead lighting to enhance the evening ambiance. Two different styles of fencing were incorporated. Six-foot tall PVC privacy fence measuring 445+ feet was coupled with 70+ linear feet of 4’6” ornamental iron fence to fully enclose the property. 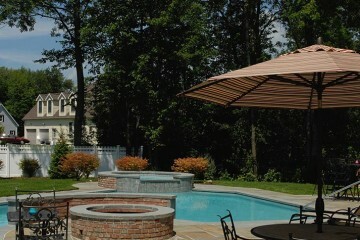 The privacy fence created an overall sense of solitude and the ornamental fence was used closer to the house to make these areas feel less confined. 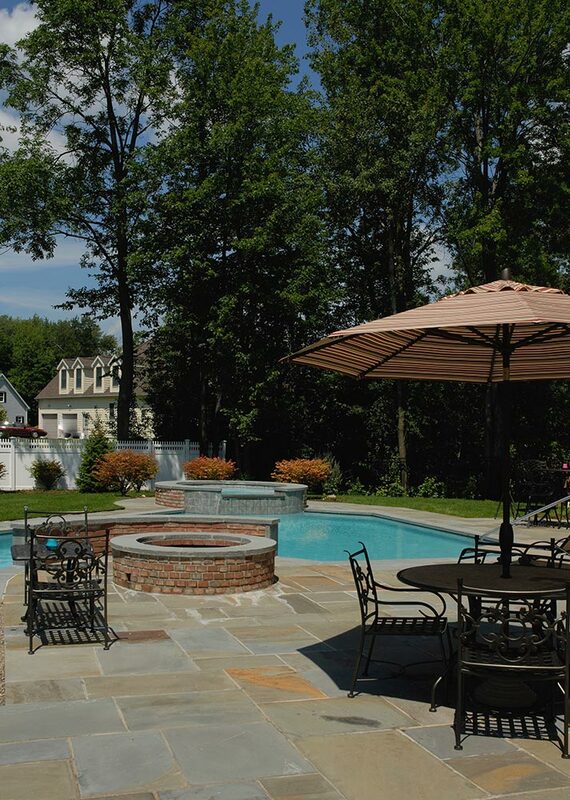 After all the necessary permits were approved, construction began with the removal of trees, tree stumps, scrub growth and the existing patios. Simultaneously, the entire rear yard was re-graded and 500+ feet of drainage system was installed to direct and control water flows. All roof water from the house was directed through the existing gutters and downspouts and connected to the drainage system via underground piping. The first stage of fencing was installed after completion of the grading. 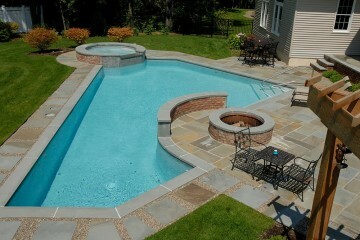 The pool installation, masonry stoops and barbeque were then constructed. All vertical masonry components were veneered with Danish brick, shipped in from Pennsylvania, to match the brick on the home. 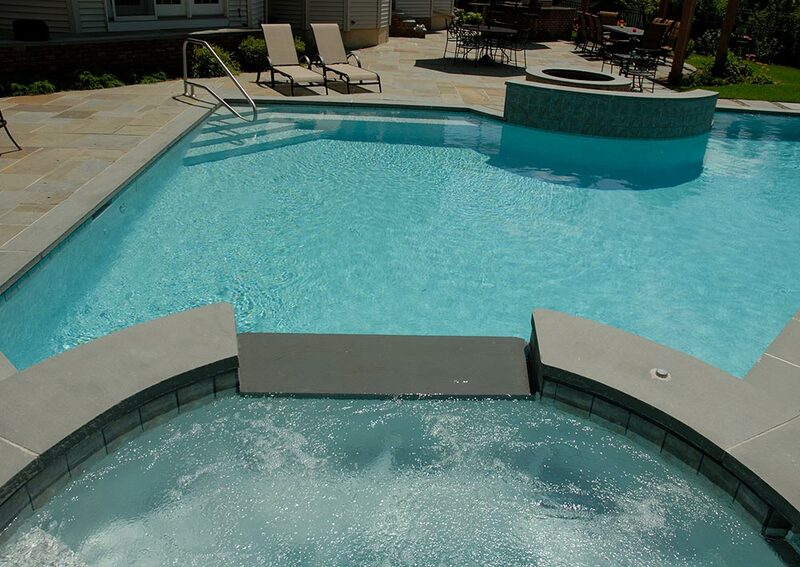 The bluestone patio was constructed over a six-inch reinforced concrete slab poured over a 10 to 12” crushed stone base and was started after significant completion of the pool construction. 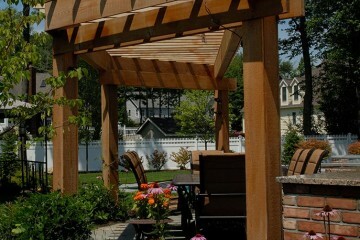 The patio was completed and the cedar overhead structure was built. 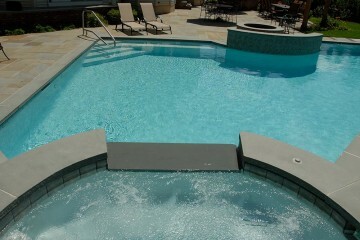 Upon final installation of the pool coping the landscape work commenced. Significant work was done to rehabilitate the existing soils, via roto-tilling and aeration, which had been severally compromised during construction. Plant materials suited to the poorly drained soils surrounding the perimeter of the property were installed, such as Red Maple, White Spruce, Redtwig dogwood and Clethra. Planting beds closest to the house and patio had new soils installed to allow for the installation of less tolerant plants such as Klondyke Azalea, Annabelle and Endless summer hydrangea and numerous perennials. All planting beds were dressed with shredded bark mulch. 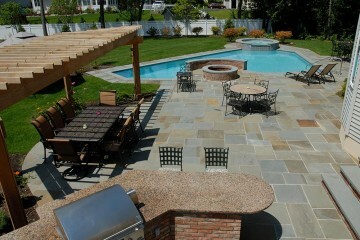 Ultimately, the project was completed with the installation of an irrigation system and sod. The design work occurred during the late spring and early summer of 2007. Construction commenced in mid summer of 2007 and completed mid fall. The property had some inherent flaws that were particularly difficult. The site soils were mostly clay and poorly drained. The unusual shape of the property meant that 4 of the neighboring properties naturally drained into the owners’ backyard that eventually made its way to a catch basin located in a drainage easement that ran along our clients southern most property line. This catch basin was part of a 25’ wide drainage easement that extended from the street to the middle of the rear yard. Probably the most difficult issue that required a delicate touch was not tangible in nature. The client was severely apprehensive, cautious and judgmental due the poor treatment and service provided by the contractor who built the home for them only three years prior.